* WINNER of the Alex & Ani Fleur de Lis Bracelet Giveaway * Renee is Living the Life of Riley! I want to give a big and hearty CONGRATULATIONS to Renee, the winner of the Fleur de Lis Expandable Wire Bracelet from Alex and Ani! Renee now has 48 hours to confirm! Renee proves that it only takes one entry to win! That's all she had in this contest and it was the lucky one! 3 Responses to * WINNER of the Alex & Ani Fleur de Lis Bracelet Giveaway * Renee is Living the Life of Riley! Congrates … Enjoy your read. .-= shirely rempel´s last blog ..It’s Time To Follow!!! =-. Thanks so much for linking up for the Fun Follow Fridays. I hope that you found some new blogs to follow and that you got some new followers as well! Please make sure to link up again Next week. .-= Lynette@ My Wee View´s last blog ..Fun Follow Fridays – May 28 =-. 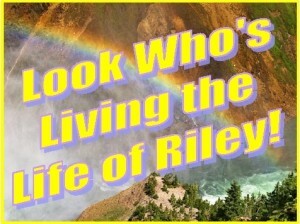 * WINNER of the Easy Stroll Ergonomic Stroller Handle Giveaway * Rita is Living the Life of Riley!